We always stay there it close in and everyone is very nice! The beds were good. no exercise room, no breakfast, rooms small. The room was very nice. The restaurant/bar was lacking. The bar was only open until 8:30 which is ridiculous if you want to have a couple of drinks before retiring. One of the evenings, it was closed altogether. They did give us a drink if we sat at a table and then they brought the check right away so we couldn't even order another one. We didn't eat at the restaurant because the menu was very limited. Hotel is a little dated and rooms are very small, but great location, wonderful staff, and very clean. Would definitely stay here again. 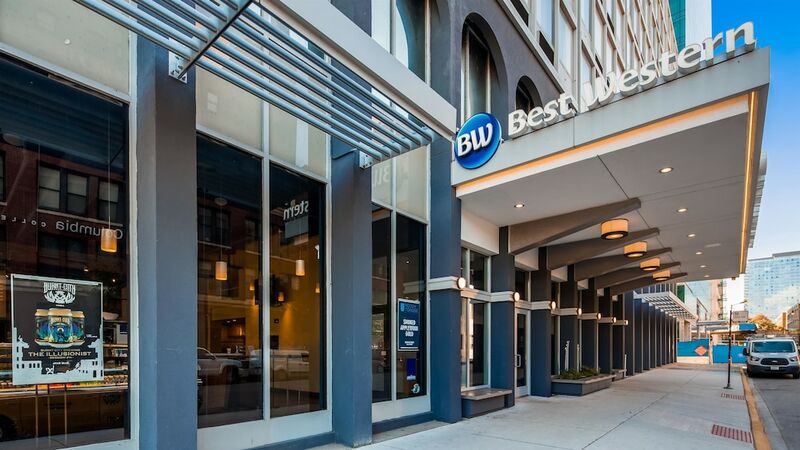 Located in The Loop, Best Western Grant Park Hotel is within a 10-minute walk of popular sights such as Columbia College Chicago and Grant Park. This 172-room hotel has conveniences like a restaurant, free in-room WiFi, and a fitness center. In addition to a meal at the onsite restaurant, you can also enjoy a drink at the bar/lounge. Get a pick-me-up at the coffee shop/café. For your convenience, a cooked-to-order breakfast is served for a fee each morning from 6:30 AM to 10:30 AM. 34-inch a TV are available for entertainment, and guests can stay connected with free WiFi. Other standard amenities include a coffee maker, free weekday newspapers, and free local calls. Best Western Grant Park Hotel features a fitness center, free WiFi in public areas, and a business center. Valet parking is offered for USD 52.00 per night. The 24-hour front desk has multilingual staff ready to assist with concierge services, luggage storage, and dry cleaning/laundry. Additional amenities include express check-in, free newspapers, and a porter/bellhop. Thank you for taking the time to mention how your stay was with us. We hope to continue to be of choice on any future stays. We are happy to know check in went well and so did your stay. We appreciate your business, thank you for staying with us once again. Our location is sure one of the best ones when it comes to sightseeing. Thank you for staying with us and letting us take care of your accommodations. Our sincere apologies for not meeting your expectations. Our sincere apologies for the noisy AC and thank you for letting us know how we can improve our service. We appreciate your feedback and our apologies about the restaurant not meeting your expectations. Thank you for letting us know so we can improve our service. Recreation features at Best Western Grant Park Hotel include a fitness center.